SwiftKey for Android is getting a Microsoft-themed update starting today, one that includes Master Chief-filled Halo stickers and familiar Skype emoji faces. There's a good reason for Microsoft all-in involvement with SwiftKey in this update. It bought the London-based predictive keyboard developer a year ago for $250 million (about £173m, AU$356m). 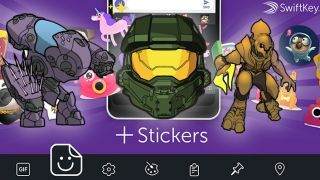 Yes, this multi-million deal now entitles you to a pack of eight animated and on-animated stickers from Halo, Microsoft's most popular video game series on Xbox. And, for the first time outside of Skype app, you use 24 Skype emoticons. Microsoft is finally giving everyone more reason to install SwiftKey keyboard again on their Android phone. These emojis and stick packs are exclusive to SwiftKey 7.0. It also got a little help from the fact that Swype, the chief competitor to SwiftKey, is no longer being supported. SwiftKey remains one of the few notable few Gboard alternative out there. Microsoft's Windows 10 Mobile ambitions have fizzled over the last two years and we have no signs of a Surface Phone, so apps like this and the Office software suite are its way secret way of playing a key role in your smartphone.